We have been really busy again !!! Taking an opportunity to go back home visit in the late March. When we come back from holidays, my little one fall sick . We reckon the weather has an impact on her. Poor little one is learning to adapt the changes of season. I thought being a child, they will adapt easier than us. Apparently , again the same old saying every child is different, so we will not know until it happen . Just so we thought , she is recover from the humid issue , Brisbane seem to get cold and chilled the past week. Again , she fall sick =.= |||. This time round is more serious - throat infection. I have a koala baby basically cling on to me most of the time. Thank God , that only for 2 days. She is much better now. The past few days seeing how suffered she is, make my heart pierce into pieces. I manage to lose some weight from the concern. ( I reckon is a good thing, as I am still trying to shake off the fat in my belly after the birth) . Being a mom is not easy , I guess this is just the starting of all the interesting journey of us. April is always a busy month for us. I have a few baking to make , as Mar and April seem to have more birthday than other one. I love to bake for those who are close to me. Is to show my love and care for them and to me is a good thing that some one remember your birthday and make something for you . There is an elderly lady in my church , whom always help us to look after my girl when the nanny is not available or when we need an extra pair of hand. She is a very gentle, loving and demure lady. Her heart is very generous in giving and she always speak words of encouragement to others. I told my husband , when I get more mature as times come I will want to be like her. That kind of gentleness and sincerity just draw people close to her. The lady love chocolate and cheese, so I guess this cake fit in the criteria. The deco cake in Maycklaw blog look just so stunning. 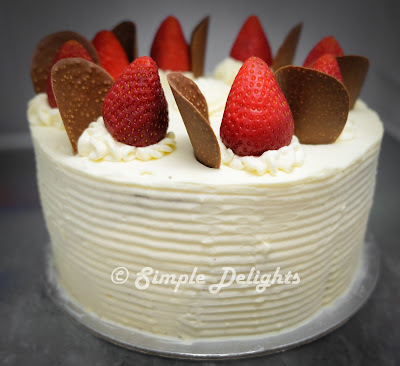 It make me started to want to try out whipping cream deco compare to buttercream . 1. Line the loose pan cake tin with baking paper. As I am using non stick loose cake tin. I line the side of the cake tin to make sure the cake rise evenly . 2. Combine cocoa powder and chocolate bites together , pour boiling water over and whisk till it smooth and melted. Add the buttermilk and mix well. 3.Place brown sugar, corn oil and egg in a mixing bowl . 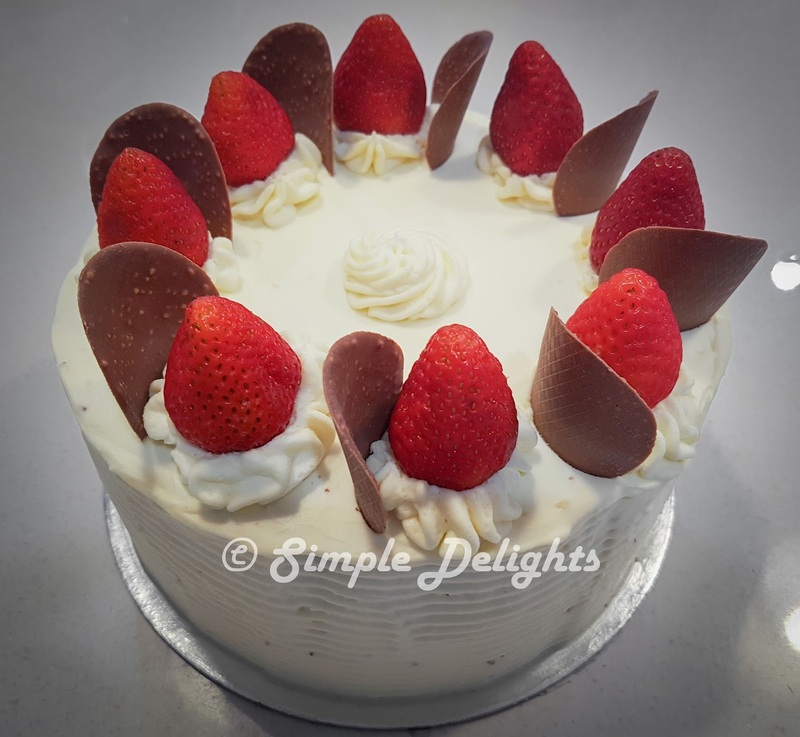 Beat the mixture until light and creamy by using electric mixer. 5. Mix in the flour mixture ,alternated with chocolate mixture till all combine well. 7. Remove the cake from the oven , leave it to cool and cut into 2 pieces. 3. Add in egg and beat well after each addition of egg till creamy. Add in the cream and combine the mixture well. 4. Pour the cheese cream batter into the cake tin and steam bake the cake for 1hour or until cooked. 5. Remove the pan from the oven and let it cool and not unmould it. 6. Chilled the cake in the fridge at least 4 hours. 7. Gentle remove the cake from the tin when need assemble the cake. 1. Sprinkle the gelatin onto the water to bloom. Let it sit on a bed of hot water so the gelatin will melt. 2. Combine the cream and lemon curd in a mixing bowl. Whip the cream with electric mixer. 3. Add in the sugar before cream started to before stiff. 4. Slowly pour the gelatin in while still whipping the cream in a stream flow. This will prevent the gelatin become lump . 1. Place a chocolate layer cake on the turnaround stand. Spread some lemon curd on top of the cake follow with thin layer of whipped cream. 3. Place another piece of chocolate layer cake onto of the cheesecake. Spread some lemon curd on top of the cake. 4. Spread thick layer of cream over the cake . Now we can cover the cake with cream and deco to your liking. I deco the cake with strawberry and some chocolate chip I bought from store. Normally I do not have a chance to try the cake I give it to others as gift. But this time, I request a piece of the cake to taste. I was given a half of the cake back. Well I thought they do not like it, turn out half of the cake is just a nice size for the 3 of them . The cake is rich in every way. 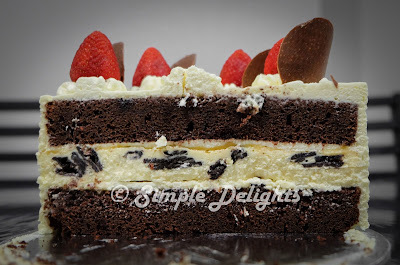 The chocolate has rich chocolate in it and the cheese cake really go well with the chocolate as a whole. The strawberry bring forth refreshness to the taste.The acidic of the fruits balance the taste of the cake. One will not feel too full when having a piece of this cake. It goes perfectly well with a cup of tea. Do try out , if you are chocolate lover , you will love the chocolate cake.